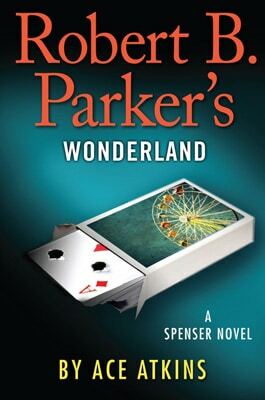 Robert B. Parker's Wonderland (Spenser)Old friends. Small favors. Bitter rivals. Stirred together, it all makes for one explosive cocktail. Spenser can feel the heat stretching from Boston to Vegas—and people are about to get burned. “Atkins…has managed to nudge this venerable series in a new direction while staying true to its core, seemingly channeling its creator at every turn. It’s a magnificent accomplishment that is not to be missed.” —Bookreporter.comComment: Robert B. Parker introduced Zebulon Sixkill in Sixkill, his final book. Ace Atkins has used Sixkill in his continuation of the series. This is the second Atkins book in his series. I previously read the final Parker book and the third Atkins book, Cheap Shot. Perhaps not surprisingly, the portrayal of Sixkill is midway between the portrayals in Sixkill and Cheap Shot. Sixkill is a significant player, but he gets badly beaten early. That causes a crisis of faith. He's not sure whether he's good enough to do the job. Oddly, his revival mostly happens off the page. He grunts a few times that he's okay, then disappears for the final third of the book. When Spenser finds him, Sixkill has triumphed--again, off the page, while the real story was unfolding. Atkins also uses a few stereotypical references--to "chief," "firewater," and "Pocahontas," I believe. But Spenser and Sixkill mock the references, so they're okay. Parker overused this kind of "joke" in Sixkill, but Atkins's use of it is realistic. As for the rest of the novel...again, Atkins mimics Parker well and offers an entertaining tale. As with the other two books, it falters at the end. Rather than building to a big climax, it sort of sidesteps to a middling climax. Atkins needs better endings if he wants his stories to be more than entertainment. Rob's rating: 7.5 of 10. "Seminole Spirit" = "savage swamp mermaid"
Should we fear "first contact"? Hicks = "angry, armed, and white"
Why are most aliens white?